Preheat a grill pan over medium-high heat or prepare a grill. Toss the shrimp with the oil, add the salt, pepper, and lemon zest and toss again. Grill until just cooked through, 2 to 3 minutes per side. Transfer the shrimp to a plate and drizzle with the lemon juice. 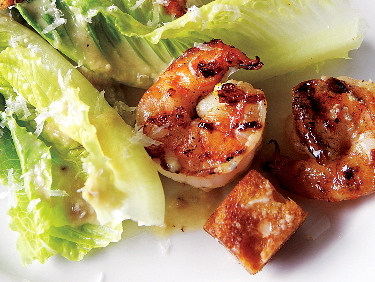 Enjoy hot or at room temperature, served over a Caesar salad if you like.